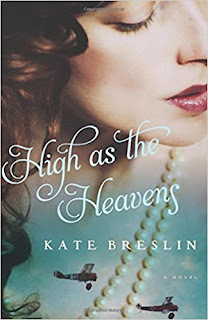 High As the Heavens is the third and newest release by Kate Breslin. It is 1917 in German occupied Brussels, where Evelyn Marche works as a nurse, waitress and a spy! When she tends to the injured of a British plane crash, she recognizes the pilot, Simon Forrester. She discovers he, too, is a spy and now a German Prisoner of War. She puts herself in danger and decides to hide him from the enemy. What happens next is more than they are both prepared for. Will their secrets be revealed? Can they survive? I really liked High As the Heavens . I enjoyed that it is actually set during World War One, which I do not find that many good reads during that time. I felt a connection to Evelyn from the start and found her to be a great heroine. There were a few scenes that seem to slow down a bit but it quickly picked back up. The danger Evelyn and Simon endured kept me on the edge of my seat and I wanted to keep turning the pages just to see what would happen next. I give this book four and a half stars and would most definitely recommend it. I received this book from the author, but was not required to write a review. This review is 100% my own honest opinion. Thank you for an honest and thoughtful review, Amy! This sounds like another great book. It's on my wish list.